The pricing in the table below is an approximate price of the additional steel required in sacrificial thickness, and it is based on steel price for structural sections. This is excluding additional costs and is based purely on steel price, while also assuming the minimum sacrificial thickness allowable. The protection offered by Cathodic Protection (CP), design life of 30 years, usually is significantly less expensive than the sacrificial thickness. The design for corrosion protection is dependent on exposure area, as with its increase the mass of steel loss increases. By increasing the sacrificial thickness, the total mass of steel increases, whilst not guaranteeing the design life. The increase of exposure area also requires an increase in cost with CP, the reason for this is the fact that the anode mass is dependent on the area. Typically for an element without paint cover it requires an estimated (at current prices) 90 AED/m2, and for an element with paint cover it reduces to 55 AED/m2, in accordance with the DNV standard. Cathodic protection is a proven technology and the likelihood of corrosion with is significantly less. There is a misconception of the maintenance cost of cathodic protection. Typically, once installed, these systems self regulate and require little or no on-going costs. International standards do not have a scheduled requirement and many times it is the owner’s apprehensiveness about the system that leads to excessive looking after. For example, it is possible to install a CP system on a jetty using sacrificial alloy anodes and not need to inspect for upto 3 years. 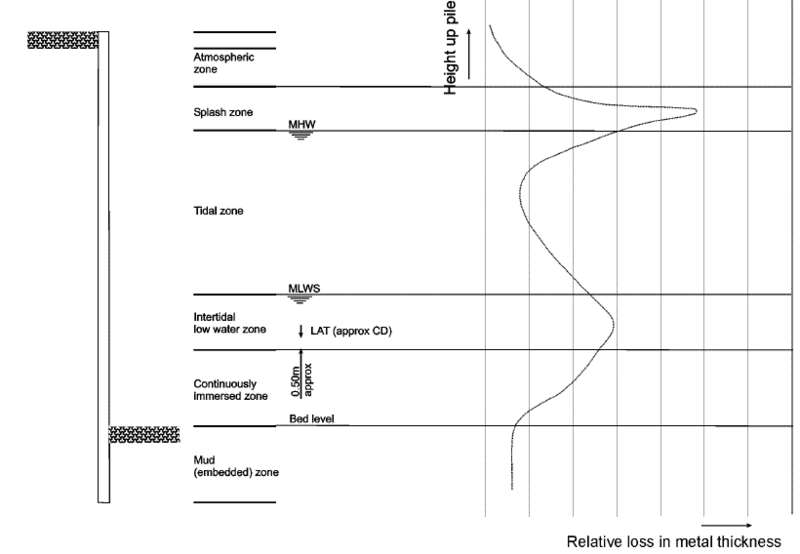 The severity of corrosion for a steel member in a marine environment varies depending on the location relative to sea water. Most design codes specify this and advise that the design can be optimised based on these corrosion rates. The section just below MLW experiences some of the highest corrosion, and this section is most prone to ALWC attack. This is an area that can be actively protected by a CP system, thus inhibiting and limiting corrosion. Therefore, negating the need of excessive sacrificial thickness for protection and insuring that the structure does not deteriorate before the allotted time. The primary reasons for corrosion protection safety for structure against failure, to prolong the life span of the element, and to reduce the total project and operation life cost. Unforeseen failure to structural elements is both dangerous and very expensive, as remedial action is far more difficult manage in comparison to providing a protective system from the beginning. A sacrificial thickness is a good methodology to obtain durability with regards to conventional, uniform corrosion. However, in conditions of extreme localized corrosion attacks it can only limit the ingress for a short period of time. For protection against these, one of two methods are recommended. First, is regular monthly inspection of all elements at risk, so that remedial action can be taken in the early stages before the reduction of safety factors. Secondly is the installation of a cathodic protection system, which is also recommended by CIRI C634, which is proven to provide protection against all forms of electro chemical corrosion, this system requires annual monitoring only.